EA7 play a great game before 15.000 people in a very hot atmosphere but its’ a little unlucky: it leades for the entire first half, playing high-level basketball, then it suffers because a little letdown, probably human in the third quarter but still responds, regain the lead enetring the last five minutes. So the game is decided in the last two minutes when some missed free throws and a turnover are crucial. Zalgiris was never challenged like that on its home court this season, but still it’s a just a moral victory for Olimpia. Langford, who scored 24 points playing a sensational game in the first half, is capable to create a thrre-point shot at the end to tie the score, but it doesn’t go in. There’s regret for losing a great game, but EA7 is back in Italy and back on track. 92-87 the final score. FIRST HALF- Oliver Lafayette is introducing himself to the game making a three, just like Darijus Lavrinovic. Zalgiris is shooting the ball really well from the beginning ma EA7 reaction is tough, Hairston makes a three, then scores posting-up. When it’s 6-5 Zalgiris, EA7 has a 8-0 run with Langford (5 points including a big three after a crossover dribble) and Fotsis. Olimpia goes up 15-8, Zalgiris is calling up the so-called reserves, Marko Popovic, Tremmel Darden and Ksistof Lavrinovic. The lithuanians are getting close, Hairston sustains Langford’s big start, Gentile is igniting a couple of fastbreaks. Olimpia’s trying to get away but it’s partially stopped by three missed free throws. The defense is standing and after a potential three-point play by Malik, there’s a huge three by Nicolò Melli at the buzzer for the 27-20 in the first period. The lead is extended to 10, 30-20, after three consecutive points scored by Hendrix, one from the line and two because of a dunk after a steal under the basket and another Langford’s drive. Zalgiris responds with a 5-0 run capped by Kristof Lavrinovic with his customary face-up three-pointer. With Hendrix and Melli bothered by two fouls each, there’s room for David Chiotti. 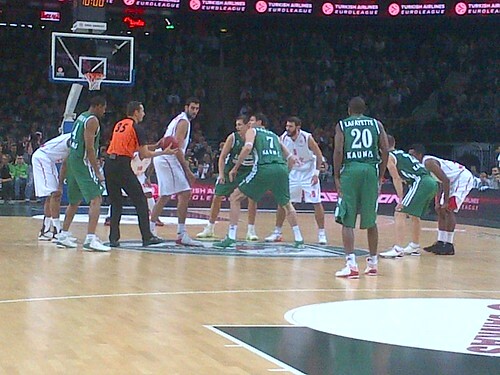 Zalgiris is within three, 29-32, when Fotsis makes a three, Langford makes a three and eventually two free throws. Olimpia is still up 38-33. It’s again a seven-point lead after a corner three by Gentile and eight when Fotsis makes one from the opposite corner. Zalgiris makes a 6-0 run because a Oliver Lafayette big half (15). It’s 46-48 when a Langfiord miss is tipping-in with a thudnerous dunk by Fotsis. The first half finishes and it’s 51-46. Olimpia has three players in double figure, Langford (17), Fotsis (11) and Hairston (10). SECOND HALF – Omar Cook makes the first three bringing Olimpia up 54-47. Zalgiris makes a 7-0 run starting when Langford is sanctioned with a foul committed when the shot-clock is running out. After the inbound play Kaukenas makes a three. Jaaber scores three times and all of a sudden Zalgiris is up 57-54. Hairston is leading Olimpia now, tying up the score at 57 and again at 59. But the third quarter belongs to the greens. Zalgiris opens up a seven-point lead because of 25-14 period. The fourth quarter is opened with Langford as the acting point-guard, with Hairston and Gentile. “Ale” scores a three then drives and dishes for Hairston. It’s 5-0 and two points down, 72-70. A Langford’s three means Olimpia is down by one, a short jump hook by Bourousis brings Ea7 back up. 75-74. The teams are changing lead every time. Hairston surpasses, then Gentile with a three, 80-78. An intentional foul called on Gentile allows Jaaber to regain the lead for Zalgiris. Then the very same Jaaber makes a three bringing Zalgiris up by five 87-82. Nic Melli makes a drive, Popovis scores an easy one, Langford makes two free throws and it’s again within three, 89-86 enetring the last two minutes. Cook draws a foul and makes only one, after the miss Fotsis grabs the offensive board and Hairston is fouled on a dunk attempt. Malik misses twice from the line, Melli grabs the rebound again, then he shoots the triple for the lead. He misses, grabs his own rebound but doesn’t control it. The last opportunity is coming on a Langford’s three-point attempt to tie the score. The long-range bomb touches the rim and get out.